A new housing delivery update to the VoWHDC Draft Local Plan (DLP) 2031, prepared under a cloak of total secrecy by the Conservative ruling group, has now been published. In their Strategic Housing Market Assessment (SHMA) they have identified a need to build, by 2031, 20,560 new homes in the Vale, 7,430 more than already proposed in the earlier 2013 DLP. 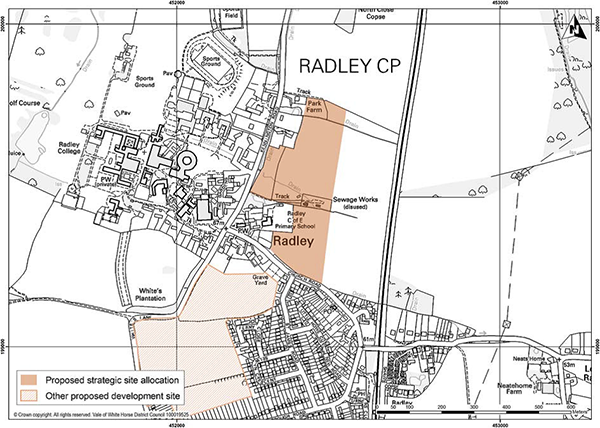 To accommodate this huge increase, it is proposed that 710 new homes should be built in Radley requiring that large areas of land around the village be taken out of the Green Belt under a new review. The Green Belt review will look at making all the vacant land enclosed by White’s Lane, Foxborough Road and Church Road; land at the Radley end of Thrupp Lane; land to the east of Church Road and Kennington Road, together with the small triangle of land opposite Foxborough Road at the junction with Audlett Drive and Twelve Acre Drive (only recently the subject of a planning refusal) available for future development. 200 new homes to the east of Kennington Road opposite Radley College and to the north of Church Road as shown in Figure 2. 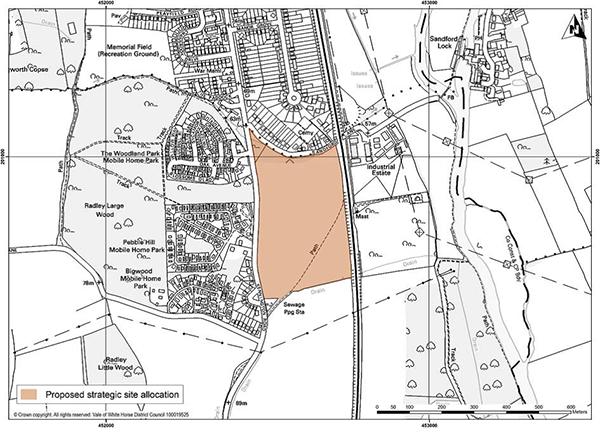 270 new homes in a southward extension of Kennington, extending south of Sandford Lane on land between Kennington Road and the railway as shown in figure 3. This proposal also threatens the existing boundary between the two parishes with the implied suggestion that the parish boundary be relocated southwards along Sugworth Lane. Apart from the threats to the Green Belt (and the opportunities created for further development) the proposed increase in the parish population is disproportionate. 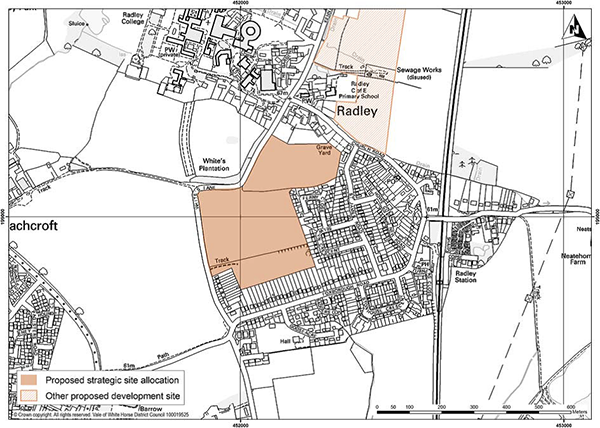 Radley currently has between 900 and 1000 homes, so the increase would be about 80% in a time frame of just 15 years. A proposed further development nearby of about 400 homes north of Dunmore Road, and 200 homes at Lamborough Hill, Wootton, will further add to the pressure on local infrastructure resources. A sweetener is that southbound access to the A34 would be opened up at Lodge Hill. However the benefits of this will probably be negated by the huge proposed developments along the A34 corridor to the south, at Milton and Harwell (5550 homes) plus new developments at South Drayton (200) and Sutton Courtenay (220), which will probably have the effect of bringing this already congested road to a standstill during much of the day. The developments are all described as “sustainable” thereby making them favoured by presumption under the terms of National Planning Policy Framework. The Housing Delivery Update is currently available for public consultation until 4 pm on 4th April 2014. Public meetings have been arranged by the VoWHDC at various locations near where development is planned, including at the Abingdon Guildhall on 11 th March at 7pm, which will be preceded by a Public Exhibition. No such Public Meeting has been arranged in Radley. Radley Parish Council has therefore called a Public Meeting of Radley residents to allow people in this parish to be informed and to make their views heard. The meeting will take place in the Village Hall, Gooseacre on Friday 21 st March at 7.00pm. Please attend (both meetings if at all possible!) and spread the word. Also, everyone should respond individually to the consultation.